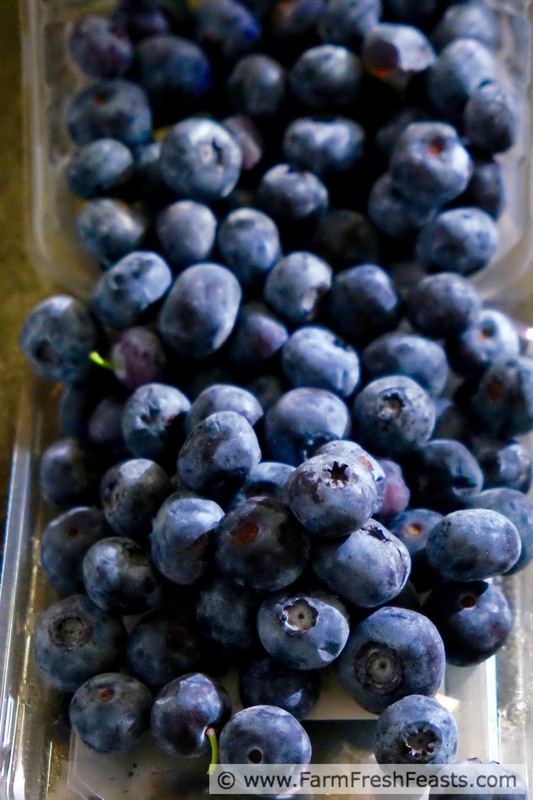 Blueberries, fresh or frozen, in a sweetened filling layered under a topping of grits?! Here's a breakfast or brunch treat that is sweet enough for a dessert and hearty enough to start your day. Make the most of what you've got is my near-daily kitchen mantra. I was inspired to buy a canister of quick-cooking grits for a side dish, but my family didn't go for the finished product at all, and I was left with an open canister of perfectly good grits. Aside to grits lovers: I know grits are good--I like them! My folks now live in a place where breakfast is provided, and when grits are on the menu mom pops back up to their apartment and fetches a package of pepper jack cheese to make her grits cheesy. Apple . . . tree . . . I know! My family members didn't spend years working across the street from the Museum of the White House of the Confederacy, however, and in addition to not loving grits these family members don't share in my love for collard greens either, so all the more for me. Except I didn't want to eat most of a canister of grits all by myself, so I started searching for other ways to use them. 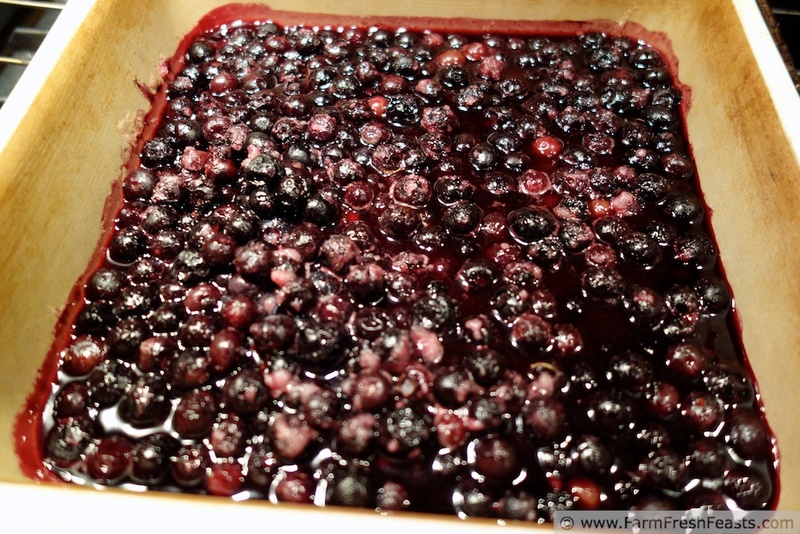 This recipe was inspired by combining this blueberry cobbler filling (that my daughter found on the internets) with this coffee cake topping (that I found on the internets). Since dessert teamwork works well in our household, my daughter prepared the filling while I prepared the topping. 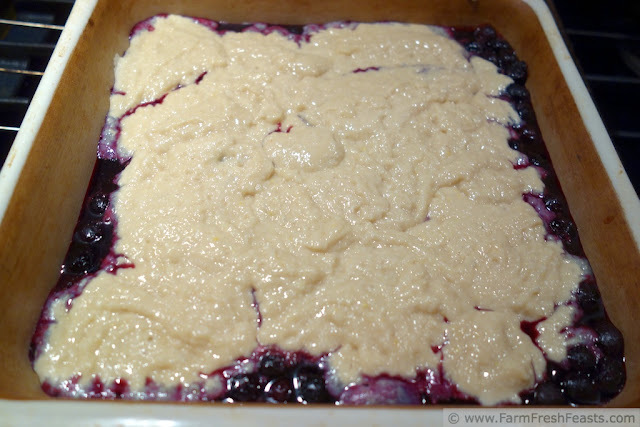 The topping ended up kind of heavy for a dessert--if you're looking for a light pillowy dumpling to absorb your blueberry goodness, try the Brown Eyed Baker where we found the filling inspiration. This was a sturdier, chewier, heartier topping, which is why I let my daughter eat a bowl for breakfast the next morning. 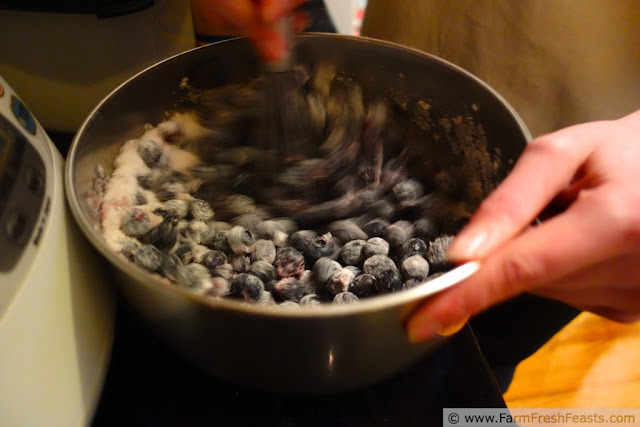 I know there's a ton of sugar in it, and it will never become a staple breakfast or even dessert in my home, but the combination of grits and blueberries really is tasty, so it's worth having as an option for a brunch. For other recipes using blueberries, please see my Blueberry Recipes Collection, part of the Visual Recipe Index by Ingredient. For other dessert ideas, there's a drop down menu on the right sidebar with ideas. For more ideas using fruit, I've got a Fruit Board on Pinterest, and I share some creations on my FB page. Want to know how to Use this Blog? Click here! Yep, those berries got put up when they were ripe, in season, cheap and tasty--and these are old photos! Preheat oven to degrees Fahrenheit. 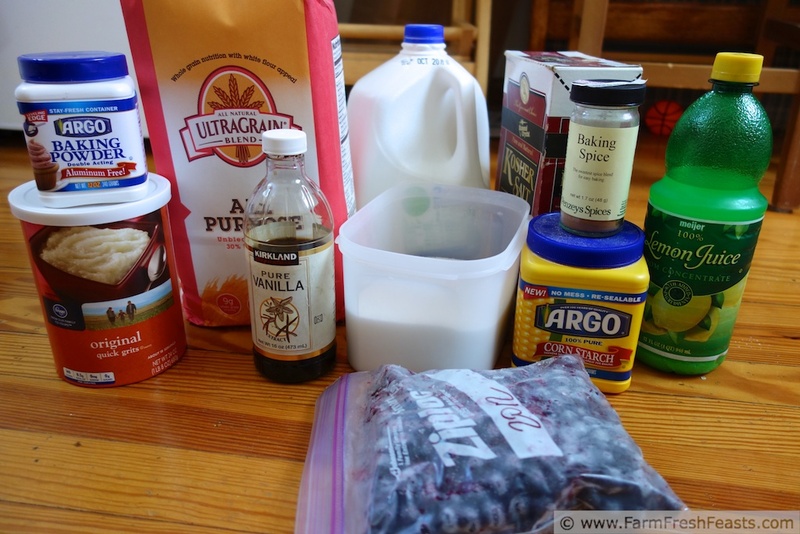 In a medium bowl, whisk together grits, flour, 1/2 cup sugar, baking powder and Baking spice until combined. 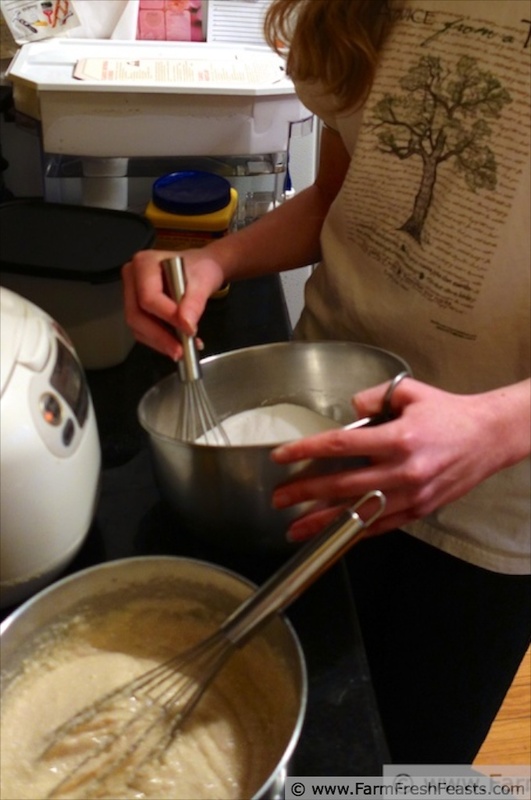 Add vanilla and milk, and whisk until thoroughly mixed. Set aside. Have your minion Combine the rest of the dry ingredients (1/2 cup sugar, the cornstarch and pinches) in another medium sized bowl. Add the blueberries, whisk to coat, then stir in the lemon juice. Pour the contents of the fruit filling into a 9 inch square baking pan. Bake for 25 minutes. Top with the grits topping, spreading evenly to the edges. Bake for 30 minutes. Cool 10 minutes, then serve. Probably not a good idea to have a scoop of vanilla ice cream alongside if you're having this for breakfast. Leftovers makes for some really great recipes. This would be just one example. Although not necessarily the best photos.